The first time I took away half my kids toys it involved an "incident." The type of incident which included three jars of baby powder; me having an out-of-body experience of unreasonable calmness; a tearful vacuuming session; and two toddlers requiring baths. As punishment for said incident there was mopping duty and half of their toys, specifically the ones coated in a layer of baby powder, were sent to the creepy basement with all our unfolded laundry. Maybe they were somehow selective about which bins of toys they tossed about and doused with baby powder. But with half of their toys in exile I expected lots of tears. I expected them to join forces and wage a mutiny of crayon hieroglyphics and Lego traps. But they carried along like these confiscated toys were never part of their lives in the first place. I realized something. They were fine with less. For about a month these toys stayed in the basement. I started to pay attention to their relationship to their toys and noticed a few trends. They had a few favourite toys. Toys they played with every single day. For my son it was cars and trucks. For my daughter it was dress-up clothes, which if I'm honest, have been crossing the line into daily wear. But the world needs more fairy princess super elephants, in my opinion. Then there were all the other non-favorite toys. In order for these other toys to hold their interest for longer than it takes me to say "chocolate-covered espresso beans" the toys had to be put "in the closet." Any toys we keep in the "closet of wonders" alongside other treasures like toilet paper and vitamins gets a special place in the hearts of toddlers. They can't access it, so they want it -- until they don't, and then back in the closet. Beyond their favourites, the cached toys, there is one other thing the kids play with. No, not all the OTHER toys about the house! They play with all non-toy items. Like that toilet paper baby my daughter tucks into the cupboard. Or that ball of yarn my son unravels around the dining table to be his "finish lines." The month with half their toys showed me they didn't need more toys, all the toys. 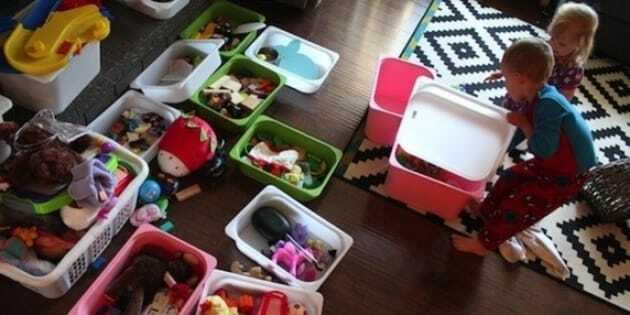 They just needed the toys they loved the most, and a cardboard box -- you feel me moms! Now don't get concerned our kids will grow wounded by the Purges of 2015, end up listening to Fiona Apple and burning incense in their room cause "nobody gets them." We involved them. Granted they are four and 2.5 and get instantly distracted by the empty toy bins up for free play. Since cutting back their toys by half they haven't asked for anything back, or feigned boredom over lack of toys. Though there has been some crayon graffiti, likely toddler gang symbols. In fact, just the other day they had a couple friends over and the kids all played with the following: costumes, the baby monitor, a fire truck and a stack of furniture leg pads (which they have been calling "their treasures" for a few days). Maybe at this point you're thinking "What's with this war on toys? They keep my kid busy and happy and I just bought these new slippers impervious to Legos?" I agree! Toys are great and valuable. They spark creativity and imagination, they keep kids busy, they help with development and social skills, and so on. But if you are like me, there were just too many. If adults get overwhelmed, why wouldn't we expect our kids to? I've found the kids are content with a few "great toys" and a lot less "okay toys." 1. Prep for them for the purge. This means looking at your own stuff first. Well, obviously not your mascara collection, maybe start with tube socks. Once you start purging your own things your kids will recognize this habit and be more likely to follow suit. 2. Compile all the toys. I'm talking all the toys that made their way into the car, under the couch, in your ensuite. Get them all in one spot, Clean Sweep style! 3. Sort by type. You might not want to do this step (as well as number 2), but by grouping all the like items you can really highlight what can be reduced. I'm looking at you 32 plastic dinosaurs! 5. Donate/Discard. Toys can be recycled, re-gifted, and donated to great places where they can go to kids who will get more enjoyment out of them than your shag gets in holding them hostage. 6. Rotate Toys. This doesn't have to be a toy closet. 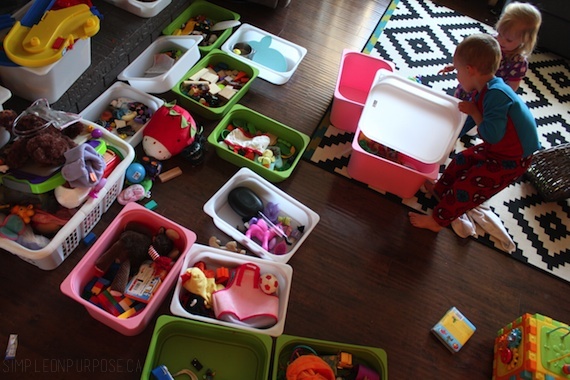 If you want to use less space storing toys, think about rotating toys between friends, maybe your town has a toy library, and there is even a trend to view the thrift store as "storage" -- you could donate and box and spend a couple dollars for a new one every few months. 7. Maintain. Purge toys every few months. Set limits about bringing more toys in. Explore new ways to give gifts to your kids that aren't toys. If you enjoyed this post and would like to read more about Shawna's journey to have her family of five live with less, check her out and Simple on Purpose, on Instagram, and Facebook.